This past Friday I had the luxury of being able to take some time off from work and attend the Lie-Nielsen Hand Tool Event in Frederick Maryland. Hosted by Exotic Lumber, the floor was cleared out to make room for several Hand tool makers, in addition to the hands on setups for LN tools. I’ve attended the LN Hand Tool events in the past, and they’re always a bla$t. Chief on my list was to meet with Matt Bickford to get my copy of Mouldings in Practice signed. I have a Rabet plane on order with Matt, and also took the opportunity to try out some of the planes he had onsite to make sure I knew what to expect when the wood and plane were properly set up. It’s been my experience from teaching that getting some hands on with tools to feel how “they are supposed to work” goes a long way to getting your own shop set up right. Matt was very willing to take the time to share with the attendee’s. 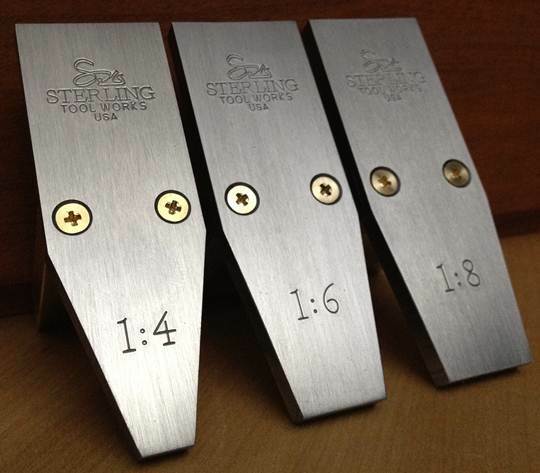 I was surprised to see other makers onsite, specifically I was able to talk with Sterling Toolworks Chris Kuehn. I had originally heard about his markers on the Renaissance Woodwork during a review of marking tools that Shannon Rogers did. Chris brought his wares to the show, and I was able to pick up a 1:6 marker on the spot. I plan on bringing this with me to future classes I’m teaching on dovetails if you want to get some hands on. They are not inexpensive, but they are well made, they look and feel really good – and I expect it will long outlast me! While I didn’t talk to Isaac Smith of Blackburn Tools, he had brought many of his saws and I was able to use his dovetail saws on some white oak. Once I got the hang of it, I found the saw cuts very fast, straight and clean. I tried both the 9″ and 10″ saws, and the grips felt very good in my hand. I expect that I will be ordering one of the 10″ saws to add to my till in fairly short order. Issac also has a saw filing guide that looks really sweet. I have the Veritas version, and a m seriously lusting after the Blackburn model just for the additional “bling”. The guide is called the Rakemaker II, and I hope to be able to play with it in the not to distant future as well. Check out Shannon’s blog, he recently was using this particular guide left handed. Last weekend I was at the Virginia chapter SAPFM meeting, and Tod Herrli was there talking and demonstrating cutting mouldings. I picked up his plane making DVD’s – and while I was at the Hand Tool event, I picked out some straight grained beech from the event’s host. I also ordered the plywood that I’m going to be using to replace/rebuild my router cabinet – that will start in the next week or so. This entry was posted in Shows and tagged hand tools, Shows, Tools on May 4, 2014 by bkbiggs.